HEWLETT-PACKARD Item Description US $ . HP 00425-62104 alligator probe assy. New in Box call . hp 01120-26101 probe pin call probe5 probe5 . HP 01650-63203 100 kOhm termination adapter 99 pod1 pod1 . HP 10002A probe 50X 9 Meg 2.5pF 250 . . .
HP 10004D probe 10:1 10 Meg 1pF 175 . . .
HP 10005D probe 10:1 10 Meg 17pF for 1Meg/20-30pF inputs 175 . . .
HP 10006D probe 10:1 14pF 10 Meg/14pF 175 . . .
HP 10014A probe 10:1 10Meg/10pF for 1M/9-13pF inputs 175 . . .
HP 10014A probe 10:1 10Meg/10pF for 1M/9-13pF inputs qty 175 probe5 probe5 . HP 10017A probe 10:1 1Meg 8pF for 9-14pF inputs 175 probe5 probe5 . HP 10018A probe 10:1 1Meg 108pF for 1Mohm 9-14pF inputs (2 avail) 175 . . .
HP 10023A temp probe SOLD hpvmd9 hpvmd9 . HP 10041A probe 10:1 1 Meg 12pF for 1Meg/20-30pF inputs 175 . . .
HP 10042A probe 10:1 1 Meg 14.5 pF for 1Meg/20-30pF inputs 175 probe5 probe5 . HP 10043A probe 10:1 10 Meg 10pF for 1Meg/10-16pF inputs 175 . SOLD . HP 10080A probe 10:1 1 Meg 9pF for 1Meg/16pF inputs 175 . . .
HP 10081A probe 10:1 1 Meg 12pF for 1Meg/16pF inputs 175 . . .
HP 10081A probe 10:1 1 Meg 12pF for 1Meg/16pF inputs 175 probe5 probe5 . HP 10084A probe 1:1 voltage 175 probe5 probe5 . HP 10202B probe divider 10:1 75 . . .
HP 10216A probe isolator (also see 8405A accessory kit) 100 . . .
HP 10221A 50 ohm tee GR 75 . . .
HP 10229A probe tip 100 . . .
HP 10231B six bit data probe (11-6) (0-5) 150 hpvm1d3 hpvm1d3 . HP 10241A 10:1 divider for 1120A 100 . . .
HP 10243A 100:1 divider for 1120A 100 . . .
HP 10269A gen purpose probe interface (see 64681A) 125 hpvm1d3 hpvm1d3 . HP 10272 state/timing probe (3+) call . 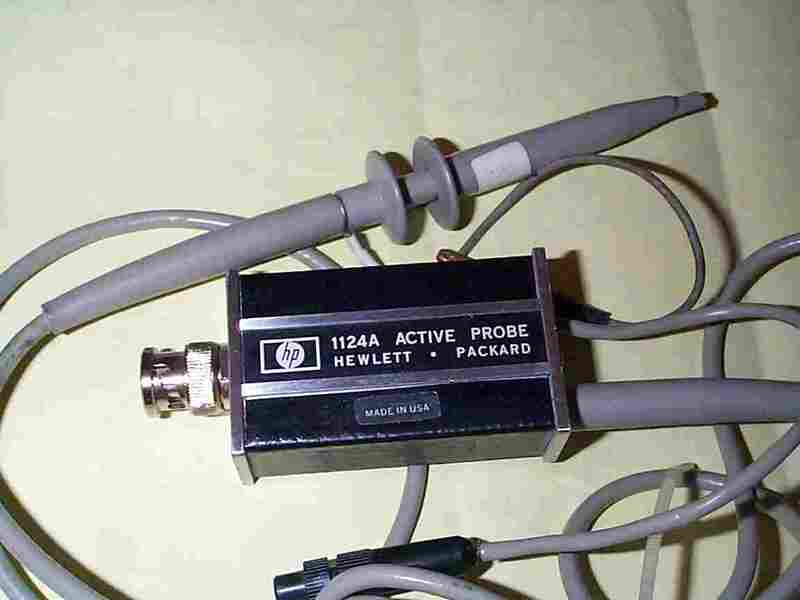 . .
HP 10277 probe interface (2) 100 . . .
HP 10347A probe adapter used 125 pod1 pod1 . HP 10347A probe adapter (5 New) 179 pod1 pod1 . HP 10400A probe assy (NIB) 125 pod1 pod1 . HP 10430A miniature 500 MHz probe (w/all accessories) 150 SOLD SOLD . HP 10431A 10:1 1m ohm//6.5pf. for 1 m ohm // 6-9 pf inputs (no acc's) 100 hp probe hp probe . HP 10432A 10:1 probe (no acc's) 100 . . .
HP 10433A probe ( no accessories) 125 . . .
HP 10435A probe 150 . . .
HP 10441A probe 10:1 1 Meg 9pF for 1Meg/6-9pF inputs 175 . . .
HP 10526T logic pulser call . . .
HP 11044A dc divider 100:1 (incomplete) 75 probe5 probe5 . HP 11096A HIGH Impedance ... 150 call for avail. call for avail. .
HP 11096B probe 200 . . .
HP 1111A ac current amplifier (only) 200 . . .
HP 1120A 500 MHz PROBE kit 500 . . .
hp 01121-62104 probe assy new in box! qty h2 h2 . 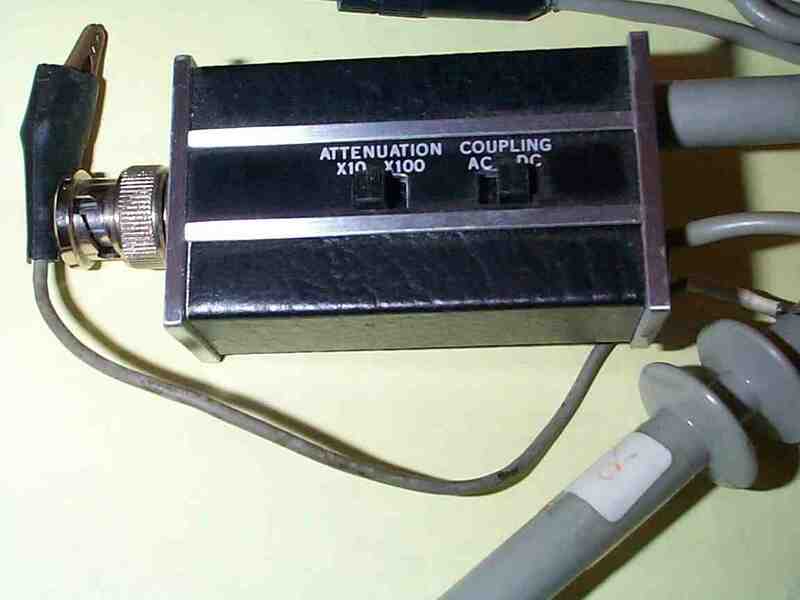 HP 1121A 500 MHz AC probe 450 . . .
HP 1124A active probe -picture- 250 qty avail. qty avail. HP 15456A eight bit data driver D8-D15 call pod1 pod1 . HP 16515-63202 1-GHz TIMING TERMINATION ADAPTOR call pod1 pod1 . HP 185A-76A sync takeoff 75 . . .
HP 187A-76C 10:1 divider 100 . . .
HP 187A-76E 50 OHM TEE 75 . . .
HP 187B-76E 50 OHM TEE 175 . . .
HP 34111A 40 KV high voltage probe call hpvmd9 hpvmd9 . HP 5090-4356 pod adapter call pod1 pod1 . HP 5356C opt 001 40 GHz frequency converter head 949 . . .
HP 54003-61617 10:1 1M-Ohm/8pF probe pod 1meter... 150 . . .
HP 54003A w/10435A 1M-Ohm probe pod kit 250 . . .
HP 54002A probe adapter 125 . . .
HP 546A current tracer 150 . .
HP 547A current tracer 200 WC WC . HP 5959-0288 bag of 20 NEW hooks NIB 50 pod1 pod1 . HP 64224A 80186 POD (2) 100 aa1 aa1 . HP 64242A 68000 U-processor 225 aa1 aa1 . HP 64264A 8051 emulator probe 225 aa1 aa1 . HP 64604A 8 channel timing probe / probe leads call qty qty . HP 64605A clock probe call . . .
HP 64681A Z8002 interface module for 1630 125 ctr ctr . HP 8405A Accessory Kit (complete) 8405A Kit 2x10216A, 2x 11576A, 2x 1250-0052, etc. 650 call for avail call for avail . HP 85024A with 11881A 300 Kc - 3 GHz with 1250-0052 bnc adapter 1550 hp hp . HP 85081B 100 Kc - 1 GHz input module SOLD 1049 SOLD SOLD . HP 97003A probe tip kit (special?) call . . .
HP E1262-62101 calibration probe 950 SOLD SOLD .